BMW dubs it a Sports Activity Coupé (SAC) and the marketing gibberish is not without some gravity, the X6 driving with indecent agility for something so tall and heavy. The X6 was a gamble, a car that BMW took an enormous punt on, and came out winning - to the tune of 250,000+ sales and rising. Read the specifications of the X6 and you’ll wonder what BMW was thinking, essentially taking the X5 SUV and removing some of its usefulness and spaciousness by adding more rakish lines and focusing more on the driver. BMW dubs it a Sports Activity Coupé (SAC) and the marketing gibberish is not without some gravity, the X6 driving with indecent agility for something so tall and heavy. Originally introduced in 2008 it’s built in the USA and the second-generation model replaced this original one in 2014. Quite possibly the most divisive car out there, the X6 might not appeal to everyone, but if it’s for you, read on. Revealed at the Detroit Auto Show and built in BMW’s Spartanburg facility in the USA, the X6 is offered with a range of petrol and diesel engines for a global audience. In Ireland you’re unlikely to ever find an X6 xDrive35i six-cylinder petrol model or the 50i-badged car with its 4.4-litre petrol V8, or for that matter the later X6M model with its even more powerful 555hp version of the same V8. Ireland, along with the majority of Europe, buys the X6 with diesel engines under its assertive bonnet. It doesn’t matter whether you’re buying a 30d or a 35d (or even the 50d that’s in the diesel M offering), as all feature a 3.0-litre in-line six-cylinder engine, their outputs varying due to tuning and turbocharging. On introduction the X6 30d produced 235hp, enough to allow it to reach 100km/h in eight seconds, the 286hp 35d shaving 1.1 seconds off that for a time of 6.9 seconds. Quick enough, then. Not for some, as the later X6 models got more power, the 30d upped to 245hp, while the 35d badge was dropped for the 40d one, bringing with it 306hp and a 6.5-second 0-100km/h time. Need faster still? The X6 M50d - again with a 3.0-litre turbodiesel engine - produces 381hp thanks to a triple turbo set-up. All drive with a verve and enthusiasm for bends that’s surprising given their size, BMW’s xDrive four-wheel drive system bringing plenty of traction. 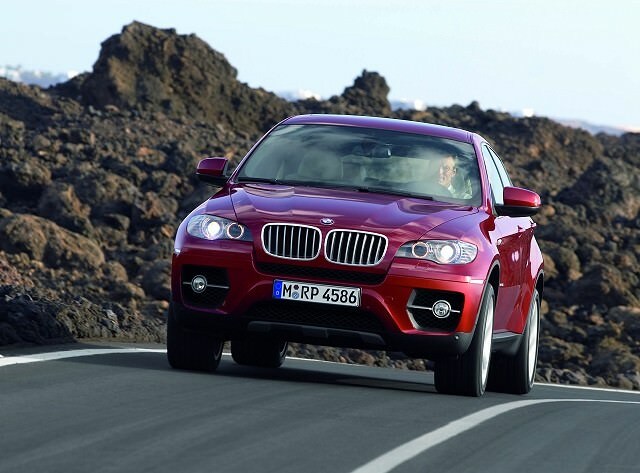 It is combined with Dynamic Performance Control that allows the X6 to drive with sports car-like poise. It's unlikely any driver will be disappointed with the X6 on the road. It’ll go off it, too, but that’s not really what it’s all about. Inside, it’s luxurious, its initial expense and range-topping status when new meaning all come very well specified, leaving you wanting for nothing when it comes to standard equipment. Not that you’ll have too much choice, as they're relatively rare. You’re unlikely to get out of an X6 30d and be disappointed with the performance and economy on offer, so we’d go for that. Unless, that is, there’s a 35d available, as it only very marginally increases consumption and emissions, and if you’re paying so much for it in the first place you might as well have the faster of the two ‘mainstream’ diesel offerings. One for those who want, and can afford, to stand out from the crowd, the X6 makes no rational sense when you line it up alongside its X5 relation. But not everyone needs the X5’s space and practicality, the X6 bringing some frivolity to the SUV (or should we say SAC?) marketplace. We begrudgingly like it, as it’s so good to drive, but we can completely understand why you might find it obnoxious at the same time.